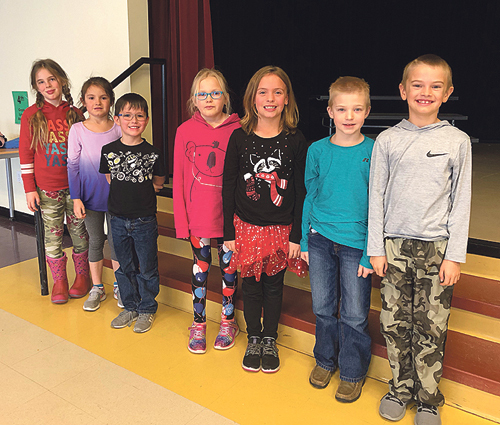 These Meeker second graders will compete in the district spelling bee Wednesday, Jan. 23 for a chance to go to state competition. MEEKER | Every year, students from all walks of life and from all over the country participate in the Scripps National Spelling Bee, one of the nation’s oldest and most iconic competitions, a tradition 90 years in the making. The 2018 Spelling Bee was the first that the Meeker School District participated in for more than 20 years, and they are thrilled to be bringing it back for its second year. Elementary school Principal Kathy Collins and teacher Keri Grieser spearheaded the effort to bring the Spelling Bee back to Meeker, feeling that it would provide a unique academic challenge to young students. The 2018 District Champion, Ainsley Selle, then 12 years old, and runner-up Montey Franklin, 10 years old, dedicated endless hours learning Scripps’ 450 school spelling words to compete at the District level. Selle then followed her District win by learning a fresh set of more than 1,000 words to compete at the state level. The practice and training help students improve their spelling, increase their vocabularies, learn concepts, develop correct English usage, and learn valuable time management skills that will benefit them all their lives. At the state level, the Selle family quickly realized that Scripps National Spelling Bee was not for the faint of heart. Selle and more than 200 other Colorado students worked their way through written spelling and vocabulary exams, with only 30 students moving on to the next level of competition. Many of Meeker’s first through eighth graders have been busy preparing for the 2019 competition. Last week, more than 150 elementary students took part in the grade-level written exams. Students who received more than 70 percent on that written test moved on to this week’s oral exam. 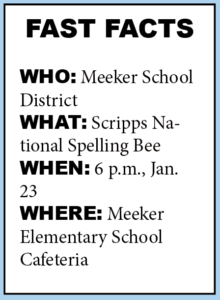 The top spelllers from each of the grades are then invited to compete in the Meeker RE-1 School District Spelling Bee on Jan. 23. The winner of the District Bee will go on to compete at the state level in March. MEEKER — The Meeker School District is moving forward with its planning process for a bond issue that will be presented to the voters this November.